I guarantee you that every reader of this BLOG can share a story of how they have been betrayed. Most of us can also tell a story of how we have betrayed people. Often, we aren’t sure if we’re the offender or the offended. If you can’t recall a time that you have felt the sting of betrayal, or the shame of betraying someone, you might have a more significant problem. Let me offer four steps to move beyond the betrayed or the betrayer. Identify the REAL issue. Most betrayal is NOT by accident. Betrayal is typically birthed out of an insecurity, or a fear. It is often manipulative to the degree that it has a motive or an anger issue. 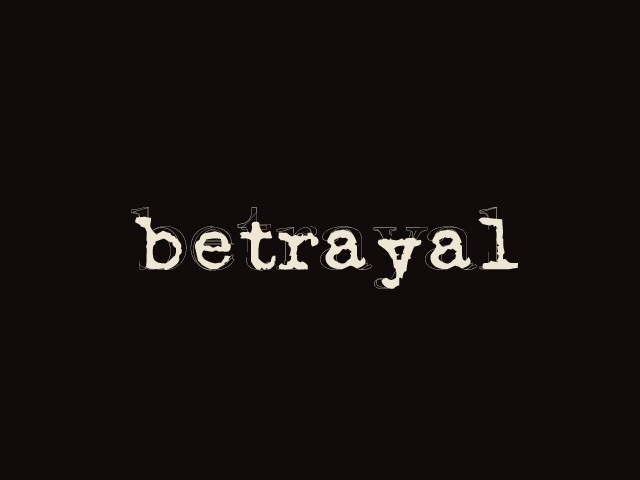 Betrayal stings because we trust in a person or an organization and they act or react in a way that is contrary to your trust. I would never encourage you to simply “get over it,” but I would encourage you to allow the Divine to simultaneously soften your heart and thicken your skin. When we choose to return the betrayal for the sake of justice, we miss the greater good that can be found if we tackle the real problem. You have to mine for the real issue, but once diagnosed, you can speak truth without emotion and make things right without trying to prove you are right. Understand at their core, people are amazingly fallible. The only thing that we offer this world is a gift of love, forgiveness and hope. Those things cannot occur without the presence of Jesus in our lives. Without the awareness and understanding that wounded people, wound people and hurting people, hurt people. Where does that leave us? It leaves us with two choices. 1)We can grow bitter and retain the hurt feelings, wounded hearts, and sensitive egos, or 2) we can forgive, pray for, and move past the betrayal. Of course, we could also reread number one and start over again. Go ahead and set a time to speak with your betrayer. You must commit yourself to a season of prayer and preparation prior to the discussion. Set your expectations on the task at hand. Don’t necessarily expect a happy closure in one convo. When we enter into a season of forgiveness there are three rules. 1) Your forgiveness is not dependent on the betrayer agreeing with you, or responding in grace. 2) Settle your heart and emotions on seeking peace first, and closure second. 3) Remember, at all cost, peace always includes humility. As you pray about confronting the person and problem – pray for wisdom, pray for grace, and pray for a healthy motivation. If the betrayal is real, emotional and hurtful, your efforts will certainly require separating your desired outcomes from your emotions. Speaking in person, and in love is both necessity and challenging. Check your motivation and ego. Then trust the truth, including the truth that might involve you being part of the problem. This is called maturity in grace. Grow bitter, or grow better. That’s the choice. Choose to prove you’re right, or make things right. Some of the gifts that come with following Jesus is peace, joy, fulfillment and flexibility. Blessed are the flexible, for the shall not remain bent out of shape! When the Divine allows betrayal to bite you, He will always use it for your personal growth and for His glory. He will also use it as others watch up close or from a distance. You may never understand all that is involved, but you can be sure that if you seek peace and seek Him, He will do what only He can do. Let Him do that for you.